A narrow corridor leads into the distance between serried ranks of shells. The slightly elevated viewpoint exaggerates the narrowing of the corridor until it almost vanishes a third of the way from the top of the photograph, and a third in from the right. 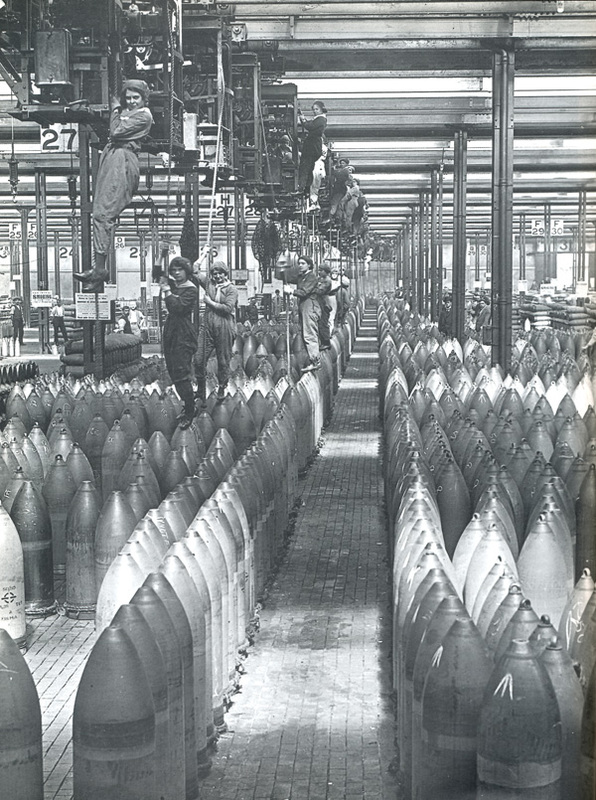 This is a classic composition that emphasises the sheer size of the factory, and the quantity of munitions stretching across the factory floor. Thin vertical shapes play counterpoint to the horizontal rails, mounted on the ceiling, that allow the movable hoists to shift across the factory. The dark and light bands of the ceiling are echoed in the pattern thrown across the shells by the regular fall of light from windows at the side of the building. The size of the factory and the number of shells positively scream industrial mass production. Composition, patterning, setting, and subject all emphasise the regularity, the sameness, the great volume of the plant’s output. It is just one factory out of the many that must service the needs of modern industrialised conflict. Indeed, the scale of the enterprise and its products seem to overwhelm the human figures in this photo. At first one notices only the front three or four women, then gradually the other women holding onto the hoists that recede into the distance, and finally the minute figures that are on the end wall just above the terminal of the path through the shells. The women are lined up almost like notes on a musical stave, between the top of the hoists and the top of the bombs. Starting with a woman halfway between those two positions, we then have two more standing on top of one shell among the mass of munitions. A line of women standing on those shells that border the path between the munitions follow on, and immediately above them, another line clings to the hoists, and stretches along to the rear, where a lit figure drops into that halfway dropped position, halting the visual progression. The most important thing here is, of course, that we are looking at women munitions workers. ‘Total war’ brought conflict to the home front, but it also necessitated the mobilisation of an entire society’s people, bringing women out from the home into a world of work that had been the preserve of men. The women give a sense of scale to this French factory and the products it makes, but – for a change – the few men seen in the photo are very much placed in the wings.